The difference between a good athlete and top athlete is that the top athlete will do all the mundane things when nobody’s looking. That’s what separates champions from the others. such as conditioning, proper nutrition, and diet. They do it to be a champion, not just because someone told them to do it. 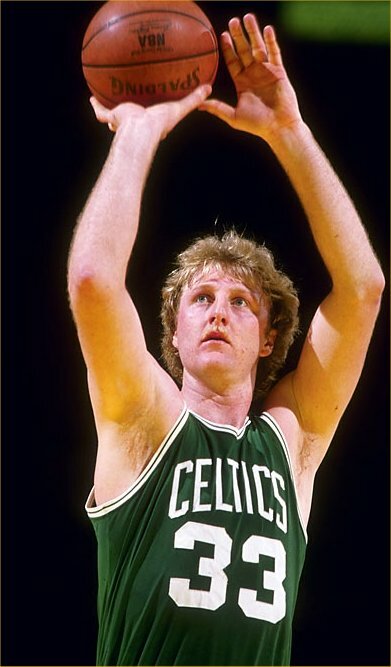 Larry Bird, for example, was the first person to arrive at practice and the last one to leave. He was always working on some part of his game that he felt needed improving. All of us practice the skills we do well. until they become their strengths. I enjoy reading about successful people and their work habits. Let’s face it, folks: “success leaves tracks”. Fortune on CNNMoney.com produced an article in 2006 called, “Secrets of Greatness: How I Work”. In the article they interviewed 12 accomplished people and examined their work habits. I refer to this article often when I am feeling stale and it invigorated and inpires me immediately…I hope YOU enjoy it too!! Executive summary: Rise early — and have the occasional jolt of joe. I get up between 5 and 5:30, and naturally the first thing I do is make some coffee; depending on my mood, it’s either an espresso macchiato or one of our Indonesian coffees in a French press. I’ll take my coffee, read three newspapers — the Seattle Times, the Wall Street Journal, and the New York Times — and listen to a voicemail summarizing sales results from the past 24 hours. This has been my routine for 25 years. There are always Starbucks with their lights on somewhere around the globe, and we open five new stores every day. So I’ve learned how to leverage my time. In the early morning I focus on Europe. I’ll call Greece or Spain or wherever, either at home or on the drive into work, to talk about challenges — do the numbers make sense? — or to congratulate them. These personal conversations are very important. At work the first thing I do is read the flash report, which is our roadmap of what we do that day. We manage day-to-day in our business. I’m proud that we are so nimble — we have great information flow to make that happen. So we attend to U.S. business during the day, and of course at night I’ll be speaking with Asia. I’m always stopping by our stores — at least 25 a week. I’m also in other places: Home Depot, Whole Foods, Crate & Barrel. I was just in a great [home improvement] store, Tokyu Hands, in Tokyo; it’s fun and it grabs you. I try to be a sponge to pick up as much as I can. I’m traveling internationally now one out of every seven weeks. China is going to be very significant for us, and it’s something I’ve been spearheading. The travel can be brutal — I got back from China five days ago, and I’m still a little under the weather. The airplane is my time to read, which I do voraciously. I carry a Treo powered by GoodLink, which works well globally. I’m not a big e-mailer, though; it’s a crutch that hinders person-to-person communication. I don’t really have any secret tools or books or tricks — other than I could always use a good cup of coffee.